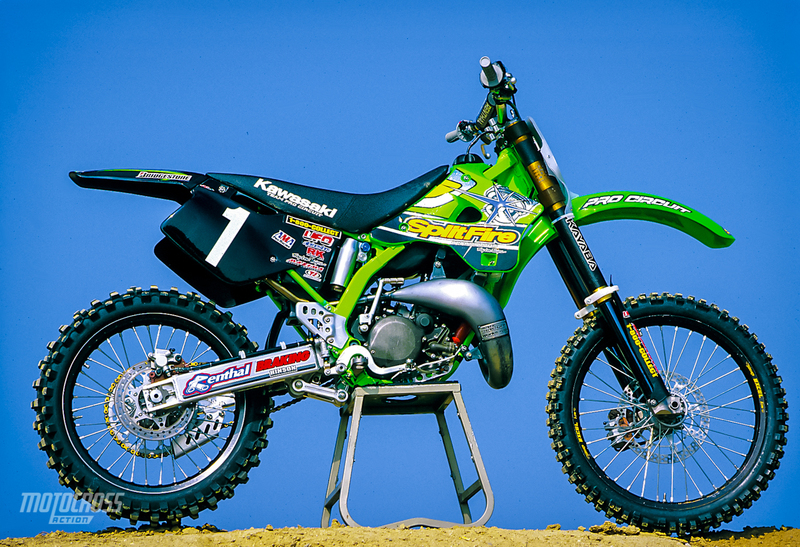 This is a test of Ricky Carmichael’s 1999 Splitfire Pro Circuit Kawasaki KX125 is from the 1999 January issue of MXA. The MXA test crew has ridden Ricky Carmichael‘s bike on many occasions. And each time we have marveled at its tremendous power and minuscule powerband. Carmichael’s powerband of choice is narrow, abrupt, attention getting, hard-to-use and violent. It is neither forgiving nor flexible. You either ride it hard or pay the price. So, as we approached Ricky’s Motocross des Nations machine, each test rider snugged his leathers tighter, pulled on his gloves, put on the race face and prepared to do his best to keep this missile on the pipe. Thanks to the European unleaded gas regulation, the Pro Circuit-built engine didn’t have as much compression which equaled less power. However, all our test riders thought that Ricky PC engine was plenty of fast. Surprise! Unlike previous RC machines, his Team USA bike actually had a powerband that didn’t require every ounce of concentration a rider had to offer. 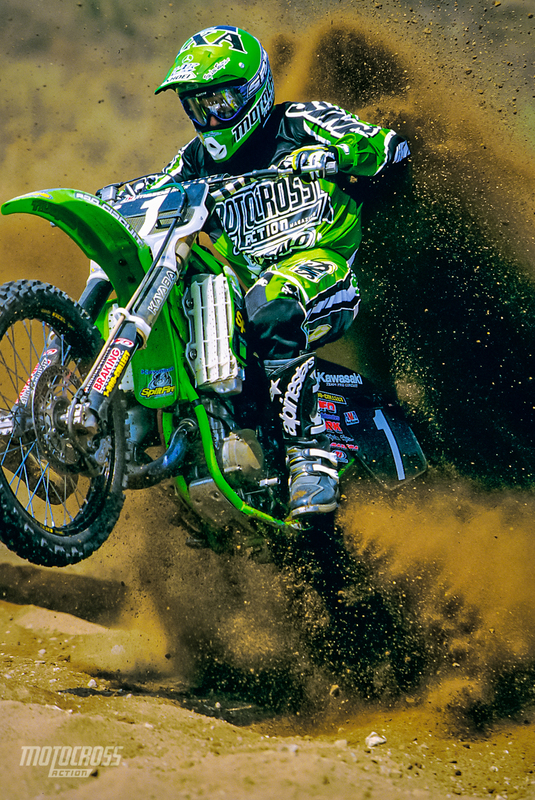 Thanks to the European unleaded gas regulation, the Pro Circuit-built engine didn’t have as much compression as Ricky’s National and Supercross powerplants. Less compression translates into a less potent hit in the midrange and a considerably longer pull on top. At first, test riders didn’t feel that Ricky’s KX125 was very fast. But that proved to be wrong. 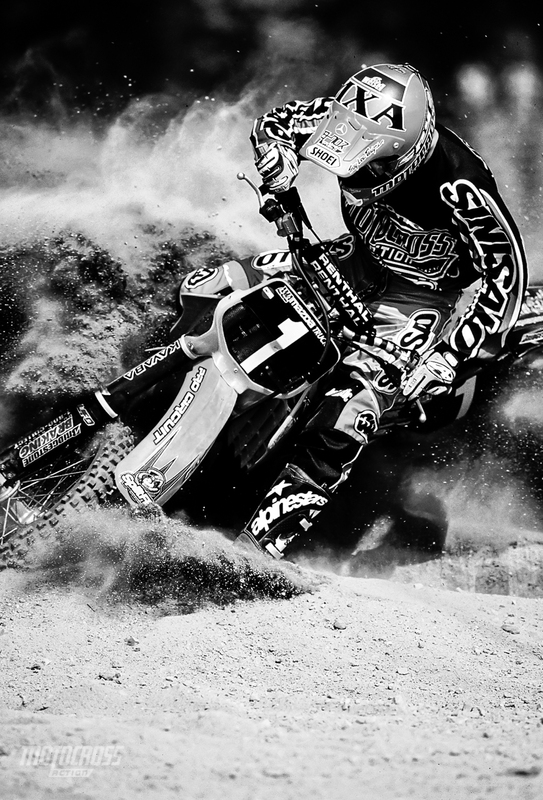 In fact, every MXA test rider was faster on the Motocross des Nations bike than they had been on his National bike. It had a melodic but flat exhaust note (instead of the barking staccato of the last RC bike we rode), and it stayed on the pipe much longer. Test riders still had to hurry it along from gear to gear, but if you flubbed a shift, a slight touch of the clutch would help it climb back into the middle. While it had less bark, its bite was more secure. It grabbed the ground and held on for dear life. 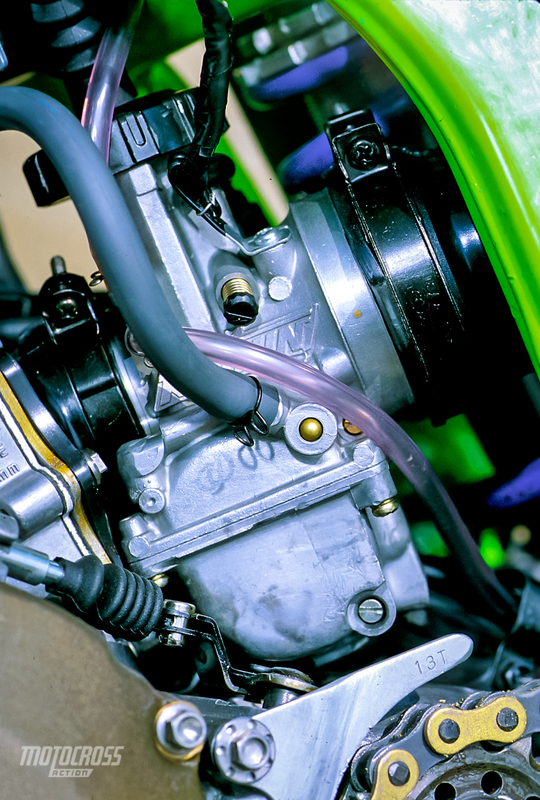 The Keihin Carb of Ricky KX125. Is it as fast as his AMA National Championship bike? No. On sheer power alone it isn’t, but with the exception of Ricky Carmichael, few riders in the world could keep his standard-issue light switch on the pipe for more than a few laps. His National bike is faster (for awhile), but his unleaded bike was more consistent. Its speed came not from a bazooka-like blast, but from the rat-a-tat-tat of a machine gun: repetitive, consistent and in the meat of the curve. Unlike most National Champions’ bikes Ricky Carmichael’s set-up is relatively friendly: his bars aren’t beyond the norm of local riders; his pedals are set in a neutral position; his suspension, while stout, actually absorbs bumps instead of pulverizing them; and his brakes are strong, but not touchy. Of the three Team USA bikes of 1999 (Doug Henry’s YZ400, John Dowd’s YZ250, RC’s KX125) Carmichael’s KX bristles with the trickest potpourri of parts. 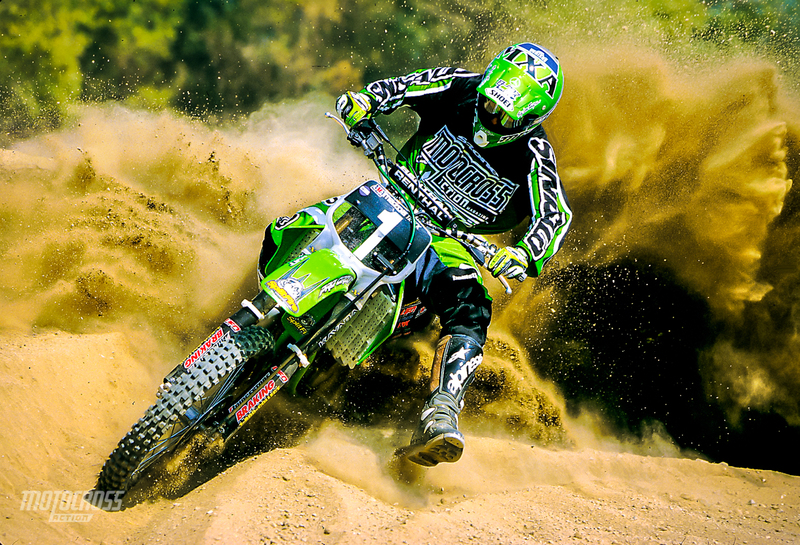 It could be because the stock KX125 needs more help, but it’s probably because Pro Circuit leaves nothing to chance. They test each component, try to improve it and then redesign to beat the new part. Part works bike, part R&D machine and part home brew, Carmichael’s KX125 is the epitome of the modern works bike.